Wants to shop online on facebook? Now you can do online shopping on facebook with the world top online retailer Amazon. Amazon has launched its shops on facebook for users to do online shopping with the variety of products online. Amazon’s subsidiary Quidisi has opened up a few stores selling household items on the social network. Quidsi, which was acquired by Amazon for $540 million in the fall, has created electronic commerce pages on Facebook for Soap.com, BeautyBar.com and Diapers.com. These are companies owned by Quidsi, and their social network presence together amounts to about 60,000 fans. When you go to Soap.com’s Facebook page, you see a tab called “My List” where you can search for and purchase products all within the social network. The shopping cart on the site looks like a more sophisticated, cleaner version of the one on Amazon.com, and lets you confirm what you want to purchase. The tool also tracks your order, and encourages you to “like” the product. 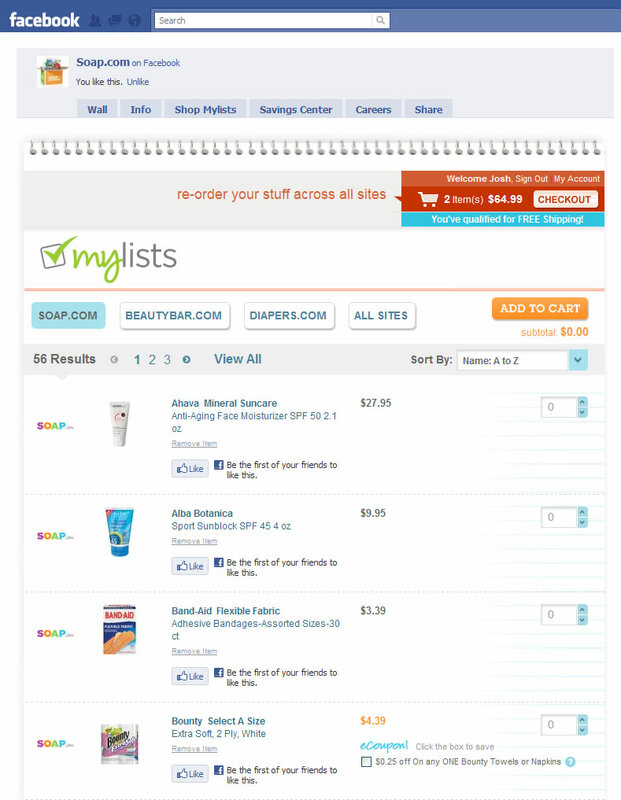 What I found most helpful was the “My Lists” tab, which let me shop across all of Quidisi’s destinations (Diapers, Soap, and Beauty Bar), reorder, and customize my shopping list. This seems like a more robust version of FatWallet. Quidisi somewhat resembles Storenvy in allowing you to shop from “stores” within a single tab. However, while Storenvy requires you to create a specific account for the application,”My Lists” just asks you for the login you’ve previously used on BeautyBar.com, Soap.com, or Diapers.com.